All dog Moms and Dads will know that sinking feeling you get when your pooch injures themselves. It could be an abrasion from a sharp branch, an insect bite or a ‘hotspot’ of irritation. It is upsetting to see your pooch in discomfort and you want to do all you can to help them heal quickly. The problem is that any kind of skin wound on a pooch can be very difficult to heal. Some wounds, such as ear tip injuries, are notorious for re-opening continually and becoming infected. Traditional bandages are very hard to put on an energetic pooch and soon come off! Added to this, is the incessant licking and biting of the wound that just makes things worse. Liquid bandages can be the ideal solution. Here is some guidance on which ones you should be adding to your first aid kit. This product is non-toxic and contains the active ingredient hypochlorous acid (HOCl) (0.003%) which is an antiseptic and kills germs around any wound. There are no antibiotics and no steroids so it does not cause a reaction on your pup’s skin. It keeps the wound clean so that the natural healing processes can take place. It will not cause harm if your dog licks or bites it and it won’t sting or irritate them when you put it on. It can be used on dry, itchy skin as well as on wounds so it is useful for soothing allergic reactions and ‘hot spots’ of irritation. It comes in a handy bottle (available in three sizes) with a pump applicator so that it can be applied to the affected area easily. 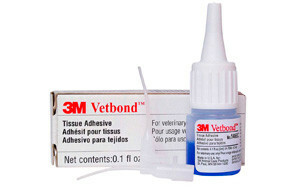 Vetbond is a tissue adhesive which actually bonds damaged tissue together. The active ingredient is N-butyl cyanoacrylate which is an adhesive and is used following surgery by vets. It comes in a 3ml bottle with a tip that can be reused. Because it polymerizes in seconds it quickly seals the wound and it is blue in colour so that you can easily see where you have applied it. It does not sting or irritate the area and gives it the best chance of healing whilst protecting it from germs. Multi-packs of up to six bottles are available. A useful ointment for minor cuts and abrasions. It works in three ways by keeping out infection, providing a physical barrier and relieving pain. The active ingredients are benzocaine which is a local anaesthetic and salicylic acid which treats irritation and inflammation. It is also useful for treating ‘hot spots’ of scratching and redness where some hair has been lost. It’s proved especially useful for treating allergies and general irritation. The product comes in a 2 ounce tube but multi-packs are available. You can treat minor injuries yourself with this general first aid product that works in several different ways. It contains natural hydrolysate collagen which provides what the wound needs to heal itself and so speeds up the healing process. Bleeding is reduced by the promotion of clot formation and discomfort and itching are eliminated. It helps to reduce the formation of scar tissue and provides a physical barrier to prevent germs from entering the wound. Dogs can excessively lick wounds which interferes with natural healing so the formula contains Bitrex – an ingredient that tastes very bitter and so discourages wound licking and biting. A whole range of injuries can be treated including cuts, burns, abrasions and even surgical wounds. It is useful for soothing ‘hot spots’ of irritation. The product is available as a gel or liquid that can be sprayed onto the injured area. This spray-on bandage for dogs seals all sorts of wounds and protects them as they heal naturally. It is made from a natural and safe organic polymer which blocks dirt and bacteria yet allows the wound to ‘breath’ and heal quickly. Because it is both waterproof and sweatproof, it will stay in place once it is applied and will fall off once the healing is complete. The product is completely non-toxic and will cause no harm if licked or bitten. You can use it for all sorts of wounds including bleeding cuts and for nail tears or after nail clipping to promote healing. It forms an invisible barrier which helps ‘hot spots’ and areas of dry skin to heal. This gel contains ferric subsulfate and aluminium chloride which prevents bleeding as soon as you apply it to a minor wound. The product also contains benzocaine which stops the wound from causing your pooch pain. It’s very useful in stopping bleeding after nail clipping accidents and tail docking and for all other minor cuts and abrasions. You can also buy the product as a powder and as pre-soaked pads. 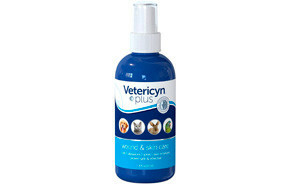 If you like the idea of a totally natural skin care product for your four-legged friend, this is the product for you. It is totally free from artificial chemicals and comes as a moisturizing foam solution. Once applied to the skin, it dries into a bandage. The active ingredient is USP Grade Sea Salt with natural enzymes to protect the wound and promote healing. You can safely use this product on dogs of all ages and is just what you need for any type of non- secreting wounds. Pop it on insect bites, patches of dry skin and irritation and ‘hot spots’. It has a low odour and dogs don’t lick it which allows the wound to heal. This is sprayed on as a liquid and within three to five minutes of being exposed to the air it dries as a bandage. The seal is waterproof and protects the wound from excessive licking. It also tastes bitter (the active ingredient is denatonium benzoate) so dogs are put off licking it at all. Air is able to get to the wound to promote healing and the liquid soothes any discomfort. It comes in a bottle with an easy to use pump applicator. This liquid bandage is designed to soothe cuts and scrapes and to promote rapid healing. It has no alcohol in it so it will not sting your pooch when you spray it on. There are natural healing and soothing agents (chamomile and aloe) which reduce redness and inflammation. There is no acrylic in the product. It is breathable to help wounds heal yet waterproof to help keep the wound dry. It can be used on more serious wounds that have been stitched and is useful for ‘hot spots’ of irritation. A great product for you if your pooch has a minor burn or an ulcer on their skin or a wound that won’t heal. It is both an antiseptic spray and a liquid bandage so it prevents germs from infecting the wound at the same time as sealing it from further damage. The active ingredient is chitosan (a natural product obtained from shellfish) which is a non-sting antiseptic making it suitable for dogs of all ages. All you have to do is spray it directly on the wound and let it air dry for a couple of minutes. It is not always easy to treat a wound on a dog. Your pooch may not take kindly to having a bandage put on them and dogs are notorious for fussing over and excessively licking wounds. This can irritate the skin further, cause the wound to be permanently irritated and slow down healing. Does it dry to form a seal? Some products simply clean and disinfect a wound. They do not have active ingredients that form a seal. They are still very useful for wound care and promote healing but are not strictly a liquid bandage. Does it contain an anaesthetic? Abrasions, allergies and ‘hot spots’ can cause your dog a lot of discomfort. A spray bandage that contains a local anaesthetic such as benzocaine can bring immediate relief and help your pooch feel more comfortable. They will leave the wound alone and allow it to heal naturally. Any break in the skin can become infected if bacteria enter the wound. Liquid bandages that contain an antiseptic such as hypochlorous acid, cut down the likelihood of this happening and help to kill bacteria that are already around the broken skin. It is important to thoroughly clean the wound before they are applied. Dogs can get carried away with licking a wound. It is a natural reaction to getting injured, and it is true that saliva does have some healing properties, but excessive licking continually reopens the wound and irritates it as it is healing. Biting the area causes even more damage. Some liquid bandages for dogs contain ingredients such as Bitrex which taste really bitter and discourages dogs from licking the area. You must make sure that any liquid bandage you buy is non-toxic because there is no way of making sure that your pooch will not get lick it. Styptic ingredients are special chemicals that stop bleeding be encouraging the clotting process. If you want to be able to stop bleeding quickly, it may be best to choose a spray bandage that contains ferric subsulfate, aluminium chloride or some other styptic ingredient. These are very useful after nail clipping. A lot of first aid remedies contain artificial ingredients that work very well to seal and disinfect wounds. If you would rather use a natural product, you could choose one with sea salt and natural enzymes for healing or with aloe for soothing. All liquid bandages for use on animals should be non-toxic. Some liquid skin for dogs products are described as free from latex, silicon, gluten and dyes so you do not have to worry about them triggering an allergic reaction. Some liquid bandages contain alcohol and this can cause stinging. It may be best to choose one that specifically states that it will not sting when it is applied. The last thing you want to do to an injured dog is cause more pain. They will remember it and won’t let you use the product again. Most liquid pet bandages are sprayed on. As the solvent (which is usually water) evaporates, they seal over the wound. An alternative is a tissue adhesive which contains N-butyl cyanoacrylate and acts like glue. It actually fixes the tissue back together and is used by vets after surgery. Some liquid skin for dogs products can be used on deep wounds but others are only for superficial injuries. Some are useful for allergies and hot spots because they are very soothing and reduce inflammation. If your pooch has a long-standing, chronic skin problem (such as an ulcer) there are products that are specifically designed to help with that. It is worth checking if the product can be used near the eyes, the nose or the mouth because some are not suitable for these areas. Always read the instructions carefully. The best liquid bandages are both waterproof and breathable. They will keep the wound nice and dry while it is healing but will allow air to reach it so that it can ‘breath’ and heal quickly. The main advantage of liquid pet bandage is that it requires no further action from you and is supposed to be hassle-free. They should be designed to fall off once the wound is healed. This is better than stitches which may have to be removed. You may be able to apply it several times. They don’t come off. There are some parts of a dog that are especially hard to bandage. The tips of the ears are a good example. Bandages don’t stay in place and the wound can reopen every time your pooch shakes their head. Nail tears and injuries after nail clipping are very difficult to apply a dressing to. 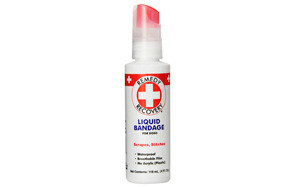 A liquid bandage spray is a good option because they are easy to put on and stay in place. Help to soothe general irritation and allergic reactions. Dry, inflamed and irritated skin can be caused by allergies. Liquid dog bandages can be sprayed over the entire area and can soothe and calm irritated skin. They often contain ingredients that reduce inflammation and a local anaesthetic that brings immediate relief from burning and itching. Good for long-term skin conditions like ulcers. Skin can take a long time to heal and some dogs suffer from chronic skin abrasions such as ulcers. Continual movement, licking and wetting slows down the healing process and infections can set in. Liquid bandages are ideal for providing protection from moisture, dirt and germs and promote healing. Help with ‘hot spots’ of irritation. ‘Hot spots’ are small areas of intense irritation that are moist and bright red. They are found most often on the head, chest and hips. Dogs obsessively bite and lick them and this sets up even more ‘hot spots’. They can be triggered by an insect bite or an allergy but can also arise because of boredom or stress. A liquid bandage for dogs is especially useful at deterring licking because they taste so bitter. Immediate relief. Many liquid bandages contain a local anaesthetic so they bring immediate relief from itching and irritation by numbing the area around the wound. They are easy to apply. They are a useful product to keep in your first aid box because you will be able to apply it yourself to minor wounds and will not have to go and see a vet. However, they can only be used on wounds that are small, clean and dry. If the wound is infected, it will simply seal in the moisture. You should always consult a vet about an infected wound. Serous wounds may need stitches and you must always take a seriously injured dog to a vet straight away. It can be used many times. One bottle will last for several months and you can use it over and over again. Other dog bandages can only be used once and then need to be discarded. They don’t have to be removed. This makes them less painful and less time-consuming than stitches. Obviously, major wounds will still need to be stitched by a vet. Q: What is a liquid bandage for dogs? A: Liquid bandages are a liquid product containing a mixture of chemicals. Usually they consist of a polymer (a compound made up of lots of smaller units) that has been dissolved in water or possibly alcohol. There is often an antiseptic and local anaesthetic added as well. When the liquid is sprayed on a wound, the solvent evaporates leaving the solid polymer behind on the wound. Several polymers are used in liquid bandages including polyvinylpyrrolidone which is soluble in water. Some use natural polymers and others use manmade polymers. Q: Is it safe to use liquid bandages on my dog? A: Yes, the best liquid bandage for dogs will be endorsed by vets for treating minor, clean and uninfected cuts and abrasions. They are also suitable for allergies and ‘hot spots’. Choose a product that does not contain alcohol to prevent stinging and distressing your pooch. It is important to note that they should not be used for large or deep wounds. They should also not be applied to infected wounds. Both of these situations require veterinary treatment. It is important to clean the wound and clip excess hair before they are applied. Q: Should I layer the product several times? A: The manufacturer’s instructions will indicate whether the product can be layered and how many times a day it can be applied. Many can be layered up to three times a day. Most liquid bandage sprays are clear so you will be able to observe the wound even though you have applied several layers. It is important that you check on it once a day to make sure that it has not become infected. The product will fall off itself so you will not have to remove it. The idea is that the wound is healed before it falls off. Q: Do liquid bandages repel water? A: Yes, the best liquid bandage for dogs will be waterproof and will stop the wound from getting repeatedly wet and promote healing. The polymer in the product becomes a semi-solid when it is exposed to air and so it will repel water droplets. However, it allows air molecules to enter which promotes healing. In order to produce a waterproof seal, many manufacturers recommend that you clip or shave excess fur from around the wound before the product is applied. An excellent non-toxic wound treatment the cleans and disinfects wounds without causing adverse reactions. It’s perfectly safe if licked or bitten by your dog which is important because dogs like to lick wounds! It keeps the wound clean and therefore promotes healing and is recommended by vets and owners as a useful addition to your first aid kit.